Adriana from Cotton Strudel herself. 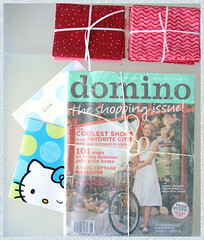 She sent me three of my favorite things: a good mag, pink and hello kitty! Now i must leave you, so eager i am to open my Domino mag and start browsing...¡Gracias, Adriana! Hope you get your parcel soon! posted by Unknown at 1:29 p. m.
Bueno, ya te lo dejaré...¡Prometido!